1) Every effort within reason will be made to run the Pro rounds on time regardless where we are at in the program. 2) In the event we are running markedly ahead of schedule, Pro, Street and V-Twin ET elimination rounds may be moved up accordingly. 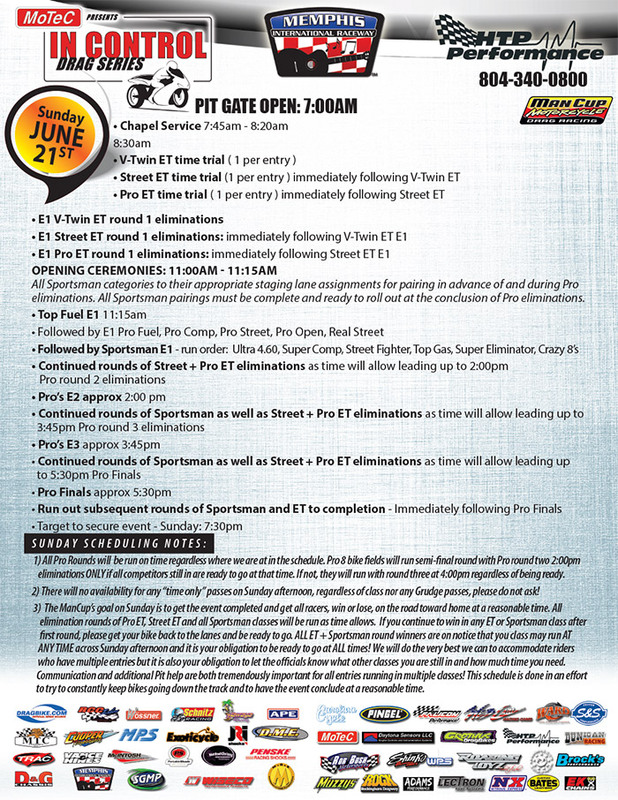 All Sportsman categories to their appropriate staging lane assignments for pairing in advance of and during Pro eliminations. All Sportsman pairings must be complete and ready to roll out at the conclusion of Pro eliminations. All Pro Rounds will be run on time regardless where we are at in the schedule. Pro 8 bike fields will run semi-final round with Pro round two 2:00pm eliminations ONLY if all competitors still in are ready to go at that time. If not, they will run with round three at 4:00pm regardless of being ready. There will no availability for any “time only” passes on Sunday afternoon, regardless of class nor any Grudge passes, please do not ask! The ManCup’s goal on Sunday is to get the event completed and get all racers, win or lose, on the road toward home at a reasonable time. 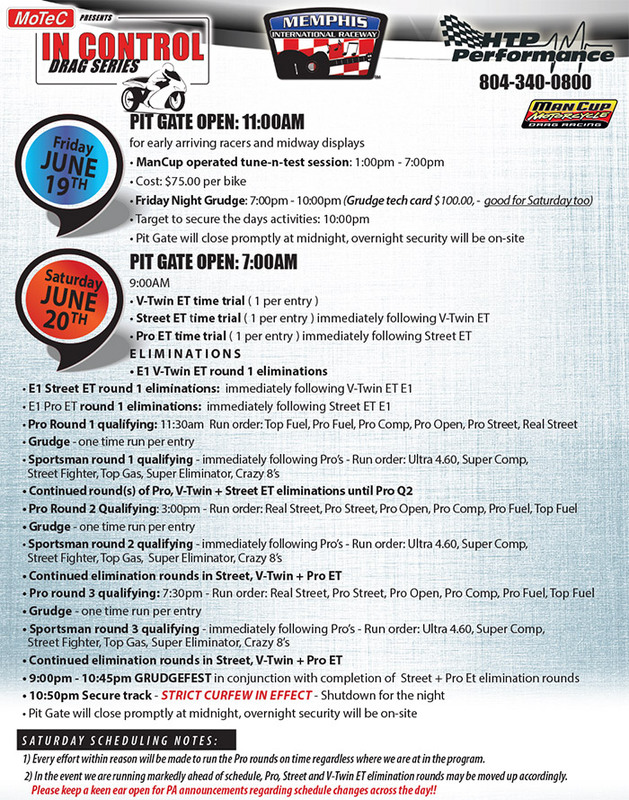 All elimination rounds of Pro ET, Street ET and all Sportsman classes will be run as time allows. If you continue to win in any ET or Sportsman class after first round, please get your bike back to the lanes and be ready to go. ALL ET + Sportsman round winners are on notice that you class may run AT ANY TIME across Sunday afternoon and it is your obligation to be ready to go at ALL times! We will do the very best we can to accommodate riders who have multiple entries but it is also your obligation to let the officials know what other classes you are still in and how much time you need. Communication and additional Pit help are both tremendously important for all entries running in multiple classes! This schedule is done in an effort to try to constantly keep bikes going down the track and to have the event conclude at a reasonable time.